Our artificial Christmas tree spruced up for the festivities. When we were planning to move to Mallorca we decided to buy a good-quality artificial Christmas tree in the UK for future use. We were pretty sure that finding a real Christmas tree for our rural Balearic island home would be as unlikely as winning El Gordo (‘the fat one’) – the hugely popular Spanish lottery draw that takes place each year on December 22nd. We’ve still not won El Gordo (perhaps buying a ticket would help? ), but only a few years passed before real Christmas trees started to appear for sale in garden centres and plant shops on Mallorca. They’re not as popular as they are in the UK – where we used to queue in the grounds of Blenheim Palace to choose and buy our tree. 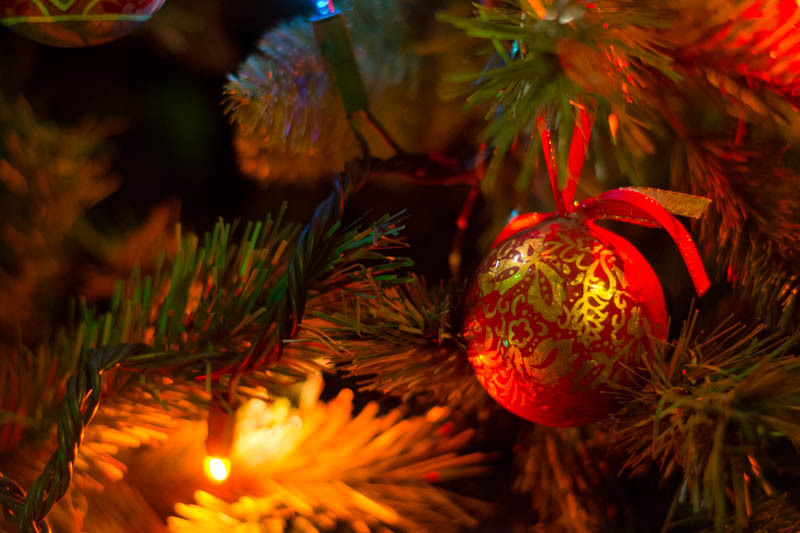 But, for the record – if you are planning to move to Mallorca (or spend Christmas in a holiday home here), you’re sure to find a real tree to decorate. Without a real or artificial tree, all it takes is some imagination (and a bit of time) to come up with an alternative. Yesterday, in the hilltop town of Artà, we spotted a clever Christmas-tree-shaped decoration made from wooden coat hangers, decorated with bright baubles, in the window of a boutique. 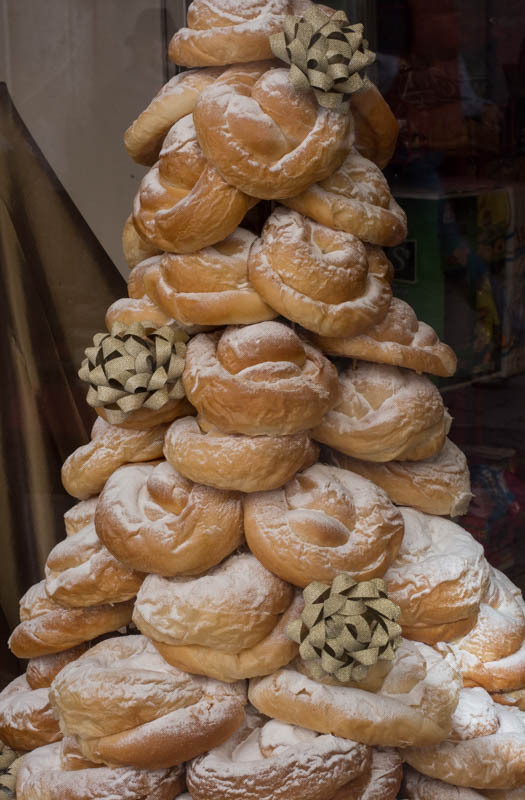 But my favourite Christmas-tree-that’s-not-a-tree was this one – seen in a baker’s shop window in the same town. I give you . . . the ensaïmada tree. The ensaïmada is the emblematic pastry of Mallorca – so what could be more appropriate? A tree with a difference! My next post will be in 2016, so The Boss and I take this opportunity now to wish you a Happy New Year. Thank you for reading Living in Rural Mallorca during 2015! Living in rural Mallorca and no longer having to commute into a city for work has given us more time and appreciation for the nature that surrounds us. We’re more aware of seasonal changes – and have become just a teeny bit obsessed about noting the ‘firsts’ of each season. It’s been a good week for ‘firsts’. We went for a walk on Sunday and retraced some of our earlier steps on the Via Verde (or Via Verda as it’s known locally). 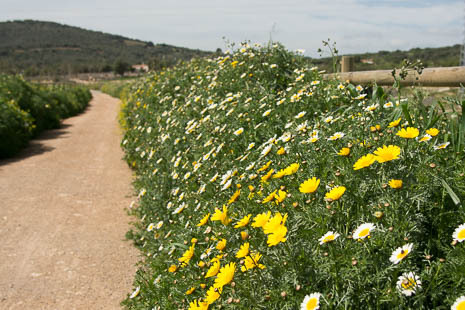 This ‘green way’ is one of Spain’s network of eco-paths – conversions of disused railway line routes – and connects Manacor with the small town of Artà, in the northeast of Mallorca. The path opened without a great deal of fanfare in October 2014 and we began 2015 by resolving to walk the full length of some 29 km – in stages – during January. A spell of bad weather meant we didn’t finish until mid-February. But, hey ho, we did it. 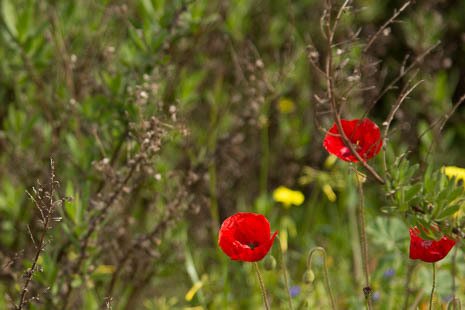 Wildflowers in abundance on the Via Verde, near Son Carrio. The path looked very different on Sunday, with so much greenery around and swathes of wildflowers lining the route. Our latest walk gave us some ornithological sightings that were our ‘firsts’ of the season: a swallow (yes, this early) and a bee-eater. In the past couple of days we have also seen our first tortoise of the spring, ambling through the undergrowth in an untamed part (one of many) of our land. 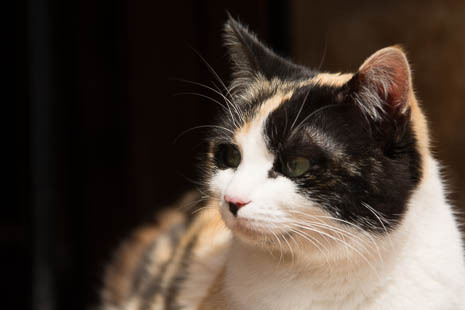 It was Pip – the newest addition to our family of adopted felines – who discovered the creature, alerted by the rustling sounds from the foliage it was navigating its way through. A tortoise was clearly ‘the very first’ for this relentlessly inquisitive little cat, and she wasn’t quite sure what to make of it! Inquisitive Pip seems to have heard something interesting . . . The sighting was good news. 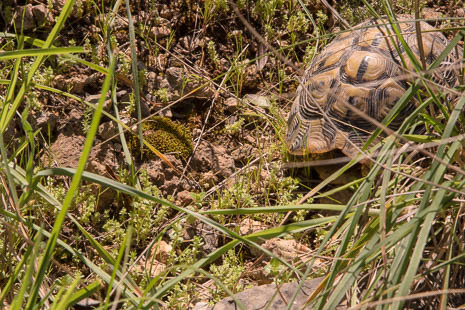 Our area is a natural habitat for the Mediterranean tortoise and we’re always pleased to see them surviving. No doubt there will be coin-sized babies soon, which means we have to tread carefully when we’re out on the land. First-time visitors are always surprised to see tortoises roaming freely around. Last autumn we heard a shout from the other side of our gates and opened them to find an English Lycra-clad cyclist with a concerned expression on his face. We explained that the creature he’d seen was a wild Mediterranean tortoise and that sightings were quite common; he beamed in surprise. It reminded us – for the zillionth time – how much we enjoy living in the Mallorcan countryside, in the midst of nature. Our next seasonal ‘first’? Who knows? But you can be sure we’ll be as thrilled as we are every season . . .